Shopping for fall is a whole closet transformation. My entire closet seems to change colors as I prepare for the colder months ahead. Olive, black, burgundy and other darker colors like these start taking over my wardrobe. Darker colors can make a person appear slimmer and taller. Which is why I like wearing these colors. 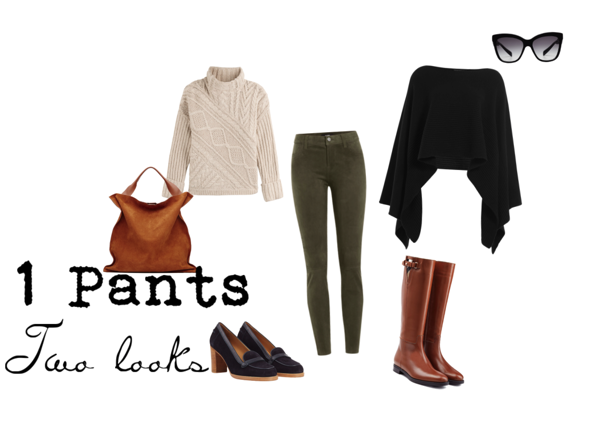 One pants and two looks, is a look that I put together for you when you feel like going with a more simpler look. Not to mention these olive colored leather pants will make you stand out from the crowd. You can easily transition these pants from day to night. You can wear it with a pair of loafers or a white sweater. Another option is to wear it with a black cape and a pair of knee high boots. I have added some similar looks for you below. I love both of these looks! I really love the boots! Burgundy is definitely one of my go to colors when it comes to my fall wardrobe. I love the look you pieced together! Love wearing leather pants, especially in the cold season! Your outfit picks are amazing! I really like the beige sweater with the green pants, the color combination is fantastic. Perfect fall colors! I love those boots!! Nice outfits! !